The Galapagos are well known for their exotic animals and the great explorers and adventurers that once visited the islands like the Beagle expedition under Capt. FitzRoy with Darwin on board. The Tecla will be anchored on the island Santa Cruz, which is connected to the island with the airport on it, Baltra. The Tecla will remain on the island Santa Cruz for a few days (wind and weather permitting) giving you the chance to see some of the best sights. Or if all the voyage crew already spend their days on the Galapagos previously, sail will be set straight away. Due to permits, the Tecla can only visit one island of the archipelago and so after Santa Cruz, it will be open sea until Easter Island – Rapa Nui. From the Galapagos to Easter Island. From a wide range of nature and animals to an island known for its statues and remarkable islander history. This voyage has it all. But besides the days of sightseeing there will be a stretch of almost 2000 NM to cover between the islands. The course straight to Easter Island would be South West. 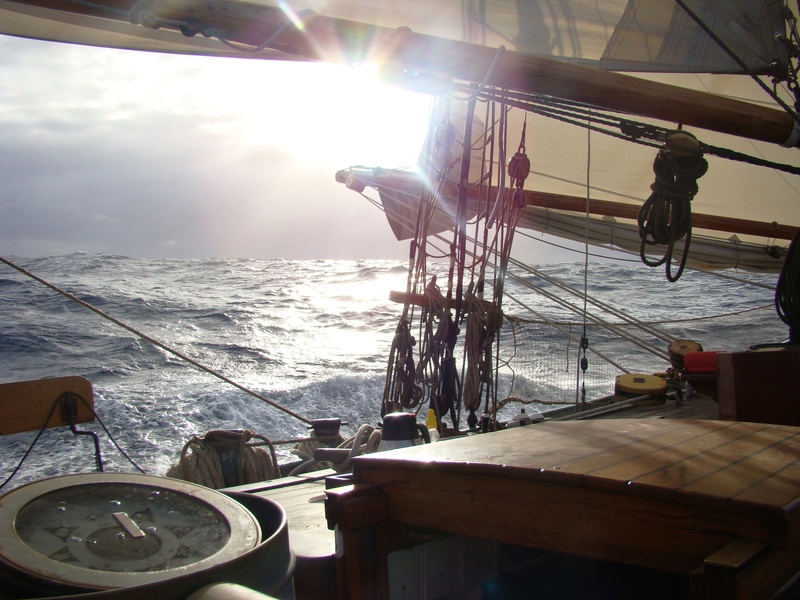 With a cold North going current along the Chilean coast (the Humboldt current) and a prevailing trade wind from the South East, the course will be set straight for the island, starting of close hauled an easing the sheets when the warmer currents have been reached. Joining this voyage will mean becoming part of the crew and working in shifts to sail the ship 24h a day, 7 days in the week. Watches will be divided on board. A 3 watch system is normally used, with 4h watches and then 8 hours rest. During the day there might be some maintenance hours if and when possible. You will steer the ship, day and night, you will help with sail handeling, navigation, lookout and some chores in the kitchen. This voyage is also ideal for those needing miles on their certificate or for aspirant sailors with a chore book from school. There will enough time to work on knots, splicing, rope handling etc. Also chart work or leading a watch can be accommodated for those wanting to learn. Please contact us for more details. Visiting these remote islands is a dream voyage. Combining real exploring with sailing, finding an island in the middle of the ocean will be a challenge. And then having time to spend on the island of arrival will be a one in a million chance. Set sail across the Pacific Ocean for 21 days and feel the freedom out on the water. Easter Island, or Rapa Nui, was discovered by a Dutch sailor called Jacob Roggeveen, in 1722. They named the islands Easter Island as it was discovered on Easter Sunday. Now the island is inhabited by over 7000 people and is part of Chile. The language spoken is Rapa Nui for the locals, but as the island is part of Chile, Spanish and the valuta from Chile (peso) are commonly used. The ancient stone figures on Easter Island are called Moai. There were erected between the years 1250 and 1500. It is thought they were carved after the likeness of the leaders of the Hanau epe - the Long Eared. After a great struggle between the people on the island late 18th century, there are no Hanau epe left on the island. Flying to the Galapagos is done via Equador to the island Baltra. The Tecla will be anchored at the island Santa Cruz, close to Baltra. Flying to Easter Islands is done through Chile, straight to the island. This voyage includes 2 days on the Galapagos and at least 1 day on Easter Island. If the voyage is a fast one, more time can be spend sailing around Easter Island. There are several anchorages where the Tecla can drop her anchor, these are open to wind and weather on different sides. This might mean that some stops are only short due to changing weather. Transport to and from the Tecla has to be booked separately. Please take in account that a day or two extra on the islands is a great option! Any land excursions are not included unless stated otherwise.